Is Darwinian evolution established fact, or a dogma ready to be overtaken by the next scientific revolution? The intelligent design movement argues the latter. Contributors take intelligent design’s two most famous claims––irreducible complexity and information-based arguments––and show that neither challenges Darwinian evolution. They also discuss thermodynamics and self-organization; the ways human design is actually identified in fields such as forensic archaeology; how research in machine intelligence indicates that intelligence itself is the product of chance and necessity; and cosmological fine-tuning arguments. Intelligent design turns out to be a scientific mistake, but also a useful contrast highlighting the amazing power of Darwinian thinking and the wonders of a complex world without design. Indeed it has. The verdict is "Guilty!" The notion of Intelligent Design, which has been deemed neither "intelligent" nor a "design", has proven another flawed attempt to dispose of evolution by natural selection. In this essay collection, a jury of "twelve good men" [why are there no women authors here? ], analyse the ideas of the major spokesmen [again!] of the ID movement. The writings of William Dembski, Michael Behe and others are closely scrutinised in terms of logic and science - and are found severely wanting. Christian "creationism" [for ID is merely "creationism under a new cognomen] wears many faces. The editors of this collection accept that the "new wave" of creationism has cast off "biblical literalism", to grant ID the rank of a "philosophy". It is the question of ID's self-proclaimed "scientific base" the essays examine closely. This is hardly a new exercise. Many authors have addressed the validity of ID, but the precision and expertise brought to bear by this group makes this collection unique. The various essayists dispassionately examine the ID contentions. Wisely avoiding the politics and polemics of the ID movement, the authors each consider elements on their merits. ID is considered here in its "scientific" and mathematical claims alone. Can "scientific creationism", an alias accepted by many ID adherents, be a valid approach to biology? The editors note that after fitful beginnings, ID surged to public awareness with Michael Behe's 1996 book. Behe, who is a master at self-touting, claims his ideas should be "ranked as one of the greatest achievements in the history of science". However, the invitation to Stockholm has been noticeably missing. Behe's contentions have been refuted so many times by so many people, it seems redundant to review them here. His argument that certain features of life, flagellum, "the" eye and other mechanisms are "irreducibly complex" - take away one [of three!] part and the system fails. His unfortunate use of the mousetrap as a metaphor has resulted in some hilarious countering designs, the best of which remains Michael Ruse's single bent wire version. Far more significant, is Behe's expressed ignorance of evolutionary processes. As Matt Young and David Ussery point out in their respective essays, not only is the metaphor fallacious, Behe's use of the flagellum is a faulted example. Many of the components of the flagellum exist in certain microorganisms, busily doing other jobs. Behe simply overlooked what else the parts of his mousetrap might be good for. Ian Musgrave's account of the evolution of the bacterial flagellum is one of the more notable essays here. Following Behe, the jury ponders the works of William Dembski. Dembski is the acknowledged "philosopher" of the ID movement. He's welcome to the title. Dembski's convoluted notions about the cosmos and life use arcane mathematical structures to "prove" "chance" cannot have generated either the universe nor life. Several essayists in "Why Intelligent Design Fails examine his contentions carefully. Dembski has argued for, but never presented evidence supporting, a "design inference". Taner Edis, Mark Perakh and Gary Hurd's essays address this and other pronouncements of Dembski's in detail. In brief, all of this "philosopher's" theses fail tests of logic and show no scientific foundation. First, I will observe that many of the critical (i.e., negative) reviews of this book are surprisingly similar in style, diction, format, and content. While this is not sufficient to justify the conclusion that they are all the product of one author under various pseudonyms, it is sufficient to raise the suspicion. Now, if I were a proponent of ID, I would say that this situation could not have arisen by chance, and would suspect that an intelligent -- if unscrupulous, and not particularly articulate -- designer was behind this apparent coincidence. Now to the point, which the critics seem to miss. The burden of proof is not on Darwinian evolution, but on alternative theories: Darwinian evolution has been, and continues to be, predominant, and if ID wants to be considered as a serious contender it needs to show that (a) it has at least equivalent explanatory power and (b) satisfies all of the usual criteria for scientific theories. Foremost among the latter is *disprovability* -- it must be possible to disprove the theory, or at least to challenge it such that its proponents must provide a (disprovable) alternative theory that has the same explanatory power. ID is not disprovable, by definition: no "theory" that has a magic escape clause ("and then a miracle happens") is disprovable, because a miracle (extra-scientific event) can always be (and always is) invoked. If (for example) human remains were found in strata corresonding to the Cretaceous -- not just once, but in many locations -- this would be a blow to the prevailing theory. This has not, to my knowledge, happened -- nor has any other piece of concrete evidence arisen to challenge evolution. All of the arguments advanced by ID proponents are "gap" arguments, or -- in the case of Behe and Dembski -- arguments based on misapplications or misrepresentations of scientific principles (such as the second law of theormodynamics). The second half of my title -- "critique by duckbite" -- refers to the tendency for the (negative) critics to fixate on one small aspect of one of the 13 chapters in WIDF. Another way to put this is that they are missing the forest by focusing on one twig on one particular branch of one particular tree. For example, to claim that an author is a sloppy scholar on the basis of one slightly incorrect citation (of a web site, no less) is simply fatuous, and smacks of ad hominem argument. If you critics are so desperate to find flaws in this book that you are fixated on trivia like this, your very desperation speaks volumes about the actual (high) quality of the book. You can't dissect this book: you have to take all of the arguments collectively, as a whole. And as a whole, it's hard for me to understand how anyone can fail to find it convincing. BTW, unlike many -- I said "many", not "most" or "all", so don't get your knickers in a twist if you happen to have read it -- of the negative critics, I actually read and understood the entire book, and am also sufficiently conversant with all of the disciplines involved that I understand all of the issues and arguments. I know the molecular biology, I know the physics, I know the biochemistry, and I am a professional AI researcher with over 20 years of practice, so I understand the philosophical and computational issues as well. The bottom line is that the only thing that distinguishes ID from creationism of any other stripe are the fact that its proponents are disingenuous about their religious bias, and its claim to scientific legitimacy: absent the legitimate scientific underpinnings, it's just another attempt to push religion into the science curriculum. And WIDF demolishes all of the supposed scientific underpinnings of ID. Demolishes. The burden of proof is on you, (negative) critics, and on Behe and Dembski and their ilk: you have not demonstrated that ID is science in even the remotest sense of the term, and until that day you have no business claiming that it's a plausible alternative to Darwinian evolution. Back in Galileo's time the church had a big argument with physics. The church held that the sun went around the earth. By looking through a telescope Galileo Galileo saw moons moving across the face of Jupiter that added impossible complexities to the Earth centered theory. In today's world the church sccepts the Sun centered theory but has big problems with biology. Specifically the argument is the Bible vs. Darwin. There is a lot of science that supports Darwin's theory. There's no science to support ID, but a lot of very conservative Christians have a strong belief, a faith if you will that Darwin just can't be right. This book looks at ID from a scientific point of view and points out that each of the psudo problems raised by the ID supporters doesn't challenge Darwin's theory. It is sad that this book will be ignored by the ID supporters who would like our children tought what amounts to the biology of ancient Greek. There's a number of reasons how one might decide to rate a book. Perhaps it is well written. In this case, it's an anthology, and some of the chapters are well written, some not as well written. I'd probably give it a 3. You might rate the book on how much you enjoyed it. I found some of the chapters way over my head, and didn't enjoy them. Others I thoroughly enjoyed. I'd again have to give it a 3. And then, you might rate it purely on how much you recommend it to others. In this context, that might be the best way to rate a book. And so I give it a 5. I'm trained as a biologist, so I enjoyed the chapters focused more on biology, and struggled through the chapters on statistics. This is not to say that they were badly written per se, but merely that I don't have the expertise to fully comprehend them. It could be argued that, in a general work like this, those chapters might have been expressed in terms more easy to comprehend. But I'm glad the chapters are included, even if I don't understand them. The Intelligent Design community has gone far afield from the original subject of biology, using needlessly complex language to give the appearance of complexity, in order to attempt to prove their point. Therefore, those who are experts outside the field of biology need to properly respond. But I completely enjoyed what I could understand, and I would recommend this to...well, everyone who can read. The rest of you should definitely buy the Book on Tape. There is a great and dark force out there, and it needs to be combated. This book explains point by point, why the Intelligent Design hypothesis fails. Having heard many of these ID arguments officially taught at the school where I teach biology, it is encouraging to hear how devastating the rejoinder is when the full brunt of science comes to bear. Of particular interest was Perakh and Young's article on why Intelligent Design is not bad science, but rather pseudoscience, for it uses the language of science and claims to be representative of it, yet ignores basic aspects of the Method. I also enjoyed Young's other article on how easy it is to create a mousetrap with only one moving part- and the mousetrap is really Behe's central argument. Yes, it's only an analogy, but it's what Behe builds his entire case on. Young shows how it's also a flawed analogy. Korthof demonstrates how little science is done by those in the literal creationist community who speak of "kinds", for the fatal flaw in most anti-evolution work is a lack of definition. No one can agree on what a "kind" is, even when only one person is in the room. There is certainly no agreement on how kinds are related to each other. Stenger's chapter on the fine-tuning of the universe was perhaps a bit disappointing. His arguments appeared to be more directed at religion than at that minority who oppose science. It is good to keep those two different perspective clear. While religion is wrong to stray into the domain of science, science should equally be wary of setting down correct philosophy for religion. Perhaps the best arguments came from Ussery, Gishlick, and Musgrave, showing how the avian wing and the bacteria flagellum could have evolved, step by step. The key problem in the arguments of Behe and his ilk is they assume that the purpose of the "irreduciably complex" structure in front of them was always it's purpose. This seriously ignores some foundational concepts of evolution. We know that, if there was design (as the ID folks speak of it), it was quite unintelligent, because objects don't work as they were intended to. They don't work as they were intended to, because most of the time, the original function of the body part is far different from it's current function. I was quite surprised to learn from Musgrave that the original function of the flagellum is secretion, not locomotion. Yes, no way it could have evolved without outside influence if were made for locomotion. There would have been no way for it to continue to function through all those intermediary steps, and still be selected for. (For a body part, if it is to continue and the individual is to spend energy on maintaining it, should not only not harm the animal, but the body part should also assist the animal, through every step in it's development.) When we realize that the original function of the flagellum was secretion, it is ridiculously easy to see how it evolved, step by step. Whether or not you agree or disagree with Intelligent Design, you should read this book to see how fully the arguments are arrayed against this pernicious hypothesis, and to see what science actually teaches. If you still disagree with the book after reading it, then at least you can honestly reject science. 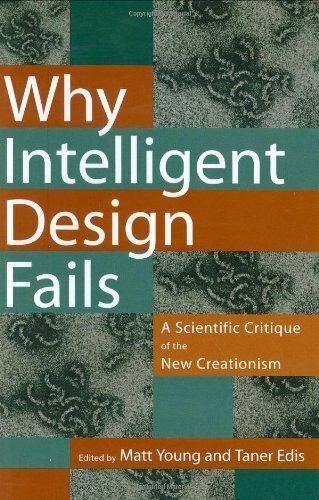 This book makes it clear as to why "intelligent design" is anything but scientific theory. All the cleverly worded and framed arguments of the ID philosophers (and the subsequent echoes by those who have studied hard to learn it's language)means nothing in the end. What matters in the end is evidence, the ability to prove (or disprove), as well as setting a foundation from which one can make predictions -- predictions that are of practical use in the real world. Evolution Theory meets all of this criteria, while "intelligent design" deftly tip-toes around it with mere words. They'd rather change the definition of science to include the supernatural and then dress these ideas up with fancy sounding terminology -- ideas that they cannot test, much less prove. The reason this book is unnecessary is that the onus is still on "intelligent design" to come up with a valid scientific theory of the biological design process - rather than the handful of seductive, emotionally driven intuitions put together by a politically and religiously motivated think tank. (Those people will always find reasons to believe what they have pre-emptively chosen to believe.) Considering an unexplainable supernatural being is at the heart of ID, it's failure to come up with this explainable biological process is virtually assured. Without this basic first step, it cannot even begin to compete with evolutionary theory. There is a reason that science is valued by those who seek knowledge about the world we live in. Anyone can come with an idea and make arguments to rationalize it -- but backing it up with hard evidence and a provable explanation of process is where science delivers and disciplines such as religious philosophy are forced to depend on language alone (even though in ID's case it attempts to use the very language of science!) Essentially, ID is for people who can't (or don't want to)acknowledge the difference. All in all, I do recommend this book to anyone who has an open mind and is confused by this fabricated "controversy". It does a good job of setting the record straight as to what constitutes valid scientific theory; as well as exposing the motivations for the thoroughly planned construction of the "intelligent design" movement. Coming from someone with extensive knowledge of all sides of the ID/evolution debate, arguments and the science thrown around, NOT TO MENTION AN EXTREMELY HIGH OPINION OF MYSELF, this is a WELL-researched NON-vague interpretation of current science and the ID platform. Assembled in a way to convince the reader that he/she will win all the debates around the office water cooler, BECAUSE PEOPLE PROBABLY STAND AROUND THE WATER COOLER TALKING ABOUT THIS SUBJECT, AT LEAST THAT'S THE IDEA I GET FROM TV, SOMEDAY I'LL GET MY OWN JOB AND SEE FOR MYSELF, this book is INFORMATIVE AND HELPFUL. If you are looking for a good probing to the gap between ID and evolution, YOU SHOULD HAVE READ THE TITLE TO THIS BOOK, BECAUSE IT CLAIMS TO BE NOTHING OF THE SORT, SO IF YOU'RE DISSAPPOINTED IT'S NOT, I GUESS YOU'RE JUST BARKING UP THE WRONG TREE. because even though written in 2004, this book SEEMS CURRENT AND UP-TO-DATE. Whether you want to win those debates (especially if your fellow debater is a well-read fellow OR MAYBE A BASEMENT-DWELLING GLUE-SNIFFER LIKE MYSELF) or you genuinely want further research on this subject, this is the BOOK FOR YOU. While negative, from the angle this review is written, one can EASILY infer the standpoint or lack thereof the reviewer has. BOY, I SURE THINK I'M HOT SNOT. I would encourage such to all reviewers who want to be regarded with integrity, especially when concerning a sensitive subject like this. IF ONLY THE REST OF YOU WERE HALF AS WESOME AS ME. Again, if you think you know my stance on this issue from this, you're wrong. THEN AGAIN, YOU COULD PROBABLY CARE LESS. Thanks for reading. He earned a B.S. and a Ph.D. from the University of Rochester, Institute of Optics. He has been Assistant Professor of Physics at the University of Waterloo, Assistant Professor of Electrophysics and Electronic Engineering at Rensselaer Polytechnic Institute, Associate Professor of Natural Science at Verrazzano College, and Professor Adjoint at the University of Colorado. He also served briefly as Guest Scientist at the General Electric R & D Center, consultant to the New York State Energy Commission, Visiting Scientist at the Weizmann Institute of Science, and Technical Editor of the trade magazine Optical Spectra. Dr. Young won the Newton Award for Achievement in the Applied Sciences at the University of Rochester and was elected to Sigma Xi, a scientific research honor society. He has earned a Department of Commerce Silver Medal for his work in optical fiber measurements, a Gold Medal for leading a group that developed a standard of fiber diameter, and the Measurement Services Award. Dr. Young is a Fellow of the Optical Society of America and a member of the American Association for the Advancement of Science and the Federation of American Scientists. He has served as Associate Editor of the Journal of the Optical Society of America, President of the Rocky Mountain Section of OSA, and Optics Correspondent for the American Association of Physics Teachers. He is the author or co-author of several NIST Technical Notes and Interagency Reports, and roughly 75 other publications, and was twice Guest Editor of the international Conference on Precision Electromagnetic Measurements. Taner Edis was born in Istanbul, 1967, to Turkish and American parents. After completing his undergraduate work at Bogaziçi University, he received his Ph.D. from The Johns Hopkins University in 1994, in theoretical and computational condensed matter physics. Working in diverse areas, from atmospheric modeling with collaborators at Lawrence Livermore National Laboratory to the philosophy of machine intelligence, he is currently associate professor of physics at Truman State University, Kirksville, MO. Fascinated by the plethora of supernatural and fringe science beliefs around him, and concerned about the rise of Islamist politics back in Turkey, Edis first got involved with skeptical inquiry into religious and paranormal claims during his graduate studies. He has since written numerous articles, particularly on the topic of anti-evolutionary thought, appearing in The Skeptical Inquirer , Reports of the National Center for Science Education , and Skeptic . He is a "Scientific and Technical Consultant" to the Committee for the Scientific Investigation of Claims of the Paranormal. His writing has characteristically combined scientific rigor with an ability to reach a broad audience. Edis's first book, The Ghost in the Universe: God in Light of Modern Science , an accessible defense of a naturalistic view of the world, was published by Prometheus Books, and received the Morris D. Forkosch award for "best humanist book of 2002." More recently, with Matt Young, he co-edited Why Intelligent Design Fails: A Scientific Critique of the New Creationism (Rutgers University Press, 2004); his Science and Nonbelief appeared in 2006. While working on his writing, Edis also finds devious ways to get his students to understand physics, serves as a slave to two self-satisfied cats, and grumbles about his wife being away at conferences too often. He is also a great fan of science fiction, where playing fast and loose with the laws of physics is not only acceptable, but positively fun.